Fiberglass / Plastic, Black . The only thing Orange is warning people about is about how dangerously fantastic your interior designer skills are. The electric hue in hardwearing material makes it clear that you know what you are doing. Get playful with Baby Blue. The resilient material is crafted to withstand daily use so feel free to use your furniture everyday, carefree. Green will definitely show off your decorating talent. This durable material is perfect to express your creativity. It is safe to say that the bright shade is safe in your expert hands. You will have your guests wondering whether your furniture is from the future with this Black. There will be no mistaking how up-to-date you are with this material choice. You will make your guests stop in their tracks when they see this Red in your space. The intense color of this strong material is an excellent way to get noticed. This is sure to get your new furniture noticed. Simply White, simply gorgeous. This material will have you loving minimalist furniture. The versatility of this classic look will ensure widespread appeal and plenty of compliments. Yellow is proven as an excellent highlighter color and it is no wonder. This show-stopping shade will make your interior design style impossible to miss. An iconic part of the mid-century modern movement, this sculputral chair reflects the revolution towards clean, simple and functional forms. Molded entirely from fibreglass, the famous La Chaise is supported by sturdy stainless steel legs and a cross-piece base made from natural wood. 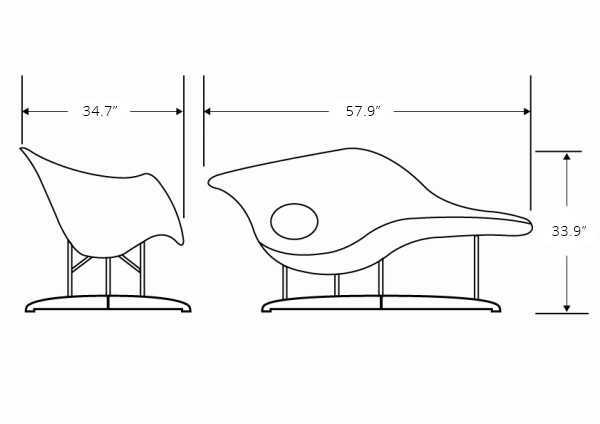 The organic shaped shell provides the user with ultimate seating flexibility, marking the La Chaise as not only an object of the design world, but also a functional chair for the modern home. Lusted after this La chaise ?for years. The main problem was the price, because the original goes for 10k! I understand it is an ?ART WORK?, and a very well respected design don?t get me wrong. So I finally just gave in and have never been happier with it. The design is a classic, I couldn?t resist! Molded Fiberglass is surprisingly comfortable, ?the wood finish is beautiful. It was definitely worth every penny for the original reproduction. I have seen the knock off, do not be tempted, this one far surpasses in quality. I just received "La Chaise" and I am quite happy with this reproduction. It was easy to attach the legs. The chair is very glossy and really everything I expected. The only downside is that getting out the chair, it does have a slight tendency to tip forward so there is some technique to getting out without having the chair tip forward. Overall though, very happy with the purchase!